If you've been living under the ocean in a decrepit, leaky city you may not have heard that Bioshock Infinite is about to have its first lot of DLC called Burial at Sea. 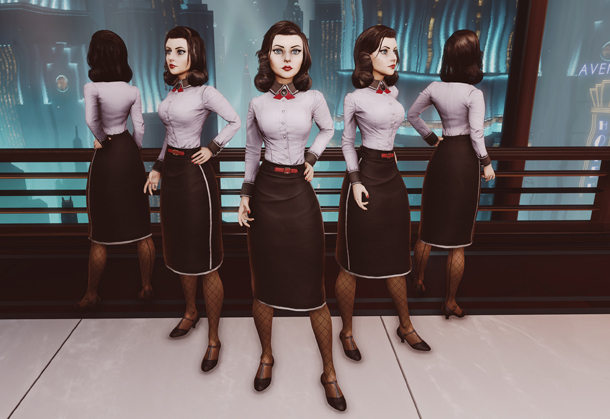 Recently, we’ve been getting a bunch of requests from the cosplay community to see Elizabeth’s entire new Rapture outfit from BioShock Infinite: Burial at Sea in order to create the perfect cosplay, and we’re here to fulfill that request with the image below of Elizabeth from various angles. Hopefully this reference will help get those sewing machines started, and we look forward to seeing all those talented cosplays at future conventions and photo shoots.